The Halloween Cowgirl turned out to be a much bigger project than I originally intended, there was a lot of trial and error with the embellishment, and the sequins drove me very near the edge of sanity. When it was finished I needed a break. Not a break from sewing, just from figuring. 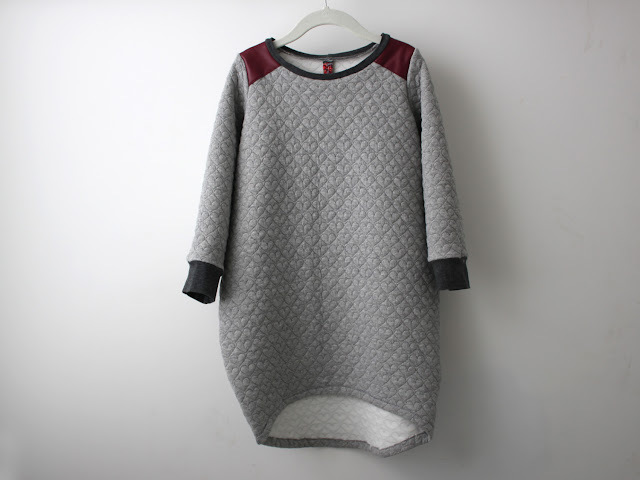 I impulse bought the Cocoon Dress seconds after I saw Trine's blog post. It's got great style, and I suspected from the t-shirt like construction that it would be a sure thing. Not to mention, L is suffering from a serious shortage of cold weather clothing (how does she grow so fast?!). A couple of Cocoon dresses would go a long way to fill that gap. 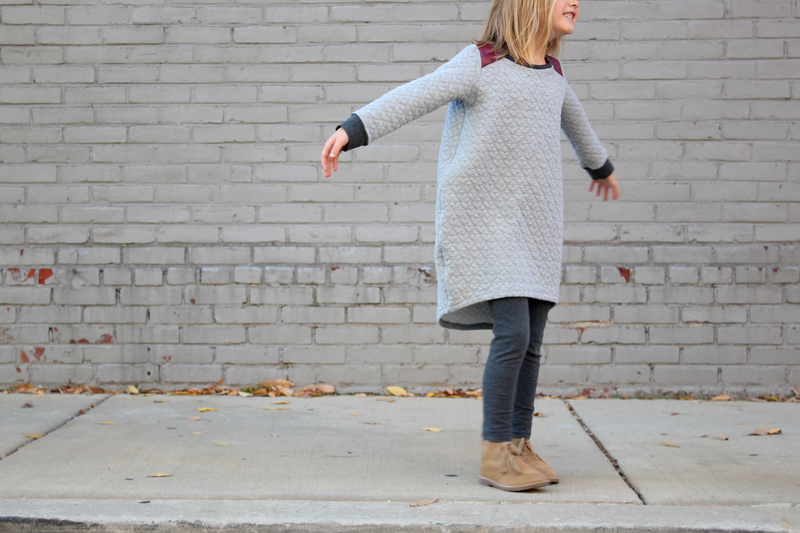 Pattern: This is the Cocoon Dress from Groovy Baby & Mama. It is a basic t-shirt dress with the addition of a few curves to give it a cocoon shape. It comes with optional shoulder ruffles. This is a great first release from GB&M, the fit is accurate, the instruction clear, the price very reasonable. I will definitely make it again, and can't wait to see more from GB&M. Fabric: Quilted Knit from the Joann Doodles Collection. I rarely impulse buy at Joann. I go in, get my staples, and get out. But this fabric had to come home with me. I only bought a yard (because I was originally thinking sweatshirt), but it's extra wide (57"), and I easily got a size 6 dress and two sets (oops) of sleeves out of it. The one short coming is that it isn't fleece on the wrong side, and isn't very cozy. Size/Fit: I think this is a pretty accurate fit. I sewed a size 6 based on L's measurements. I could probably have gone up to a 7 for additional wear, but wanted to play it safe since this is my first attempt, and L wasn't home when I was cutting. Alterations: Because this is a Groovy Baby & Mama pattern decided to do it up in GB&M style. Instead of the optional shoulder ruffles, epaulettes at the shoulders. The pleather accent goes a long was to give this super sweet fabric a little edge. To make a clean neck finish with the added material I used a neck band rather than turning the raw edge under as directed. This fabric is sweatshirt weight and I wanted it to wear like a sweatshirt. I lengthened the sleeves by 3 inches and added 2 inch cuffs, so that L could wear it without a cardigan. So pretty and so wearable! Definitely wearable! I was going to make L a sweatshirt with this fabric, but the dress is more what she likes to wear. Wow, this dress is so, so awesome! You nailed it! And I love her shoes, too! All around amazing outfit! This is a great dress! My daughter would love it. And I kind of want it in my size, too! OMIGOSH! It's so cute!! 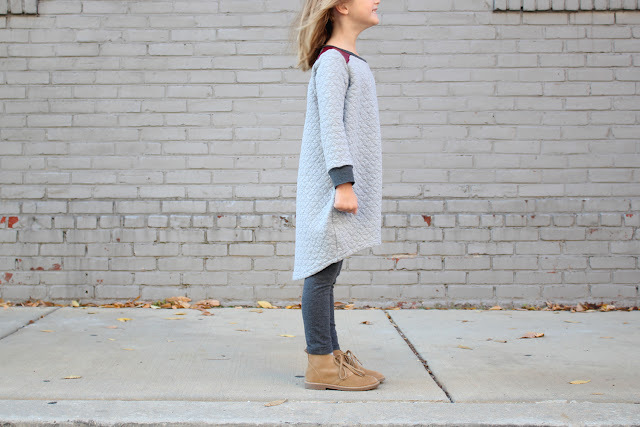 That quilted fabric is perfect, and love the whole way you styled it. She looks totally cozy. The boots are great too. Thanks Kristin! I was thrilled when I found the fabric at Joann. It looks like something Miss Matatabi would carry, so nice. Love this Kristi! Needs some red cowboy boots! I love it. Nice touch with the epaulettes. I bought the pattern yesterday and can't wait to make the dress for my little girl.